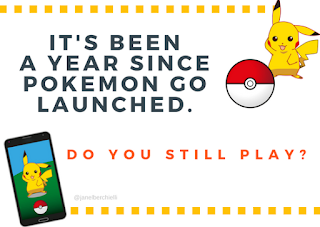 Do you still play Pokémon Go? It has been a year since the Pokémon Go app came out. Last year everyone and their grandma were playing this game. It was great it brought kids outside & people walked around getting exercise. Who know such a game on a phone would go viral so fast? Probably sometime within the first six months the Pokémon Go phenomenon started to wear off for many people. Kids went back to school, schools blocked the app and the fun vacation time was over for many. 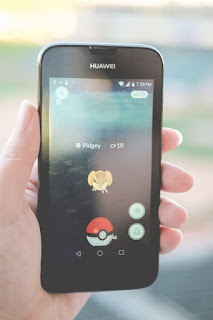 Some people got bored quickly because they were not able to advance in the game and it got difficult to find new Pokémon to catch. The makers of the Pokémon Go have made several changes to the app, probably in hopes to gain new players or to keep the ones who have decided to stick around. Some of these noted changes are new Pokémon characters, more Poke-stops, rewards for playing daily and the newest feature Raids. I admit I still don't fully understand the new features but I hear they are fun. I've decided to stick around and play the game. But the past few months I have slacked off and honestly only play when I'm in line at Starbucks or the grocery store. I'm sure there are still lots of active Pokémon Go players, but I personally don't know too many.